The Monadnock Alliance for Sustainable Transportation and the previous MAST/MRTMA website were created by the hard work and perseverance of the former Travel Demand Management Advocacy Group for Keene and Beyond. 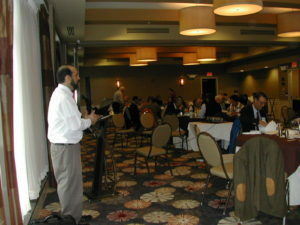 J.B. Mack speaks at the 2010 TranSymposium event hosted by the Transportation Demand Management advocacy group for Keene and Beyond. This group, which officially formed in 2006, worked to build the foundation for a regional Transportation Management Association. In 2009, the group received a grant from the NH Charitable Foundation to promote travel demand management, which led, in part, to the creation of this website. In November of 2010, with support from both the NH Endowment for Health and NH Charitable Foundation, the group held the Monadnock TranSymposium, which helped launch the creation of the Monadnock Region Transportation Management Association, or MRTMA. In the summer of 2015, the MRTMA Steering Committee decided to change the name of the coalition to the Monadnock Alliance for Sustainable Transportation to better reflect the goals of the group. To learn more about the MAST Steering Committee, please visit the “Meet the Steering Committee” page. The Steering Committee meeting schedule is posted on the “Meetings” page.